actual scan of card to show centering. corners are crisp and edges are sharp. Card #216 of the 1981 Topps set is the rookie card of one of the greatest of all time. 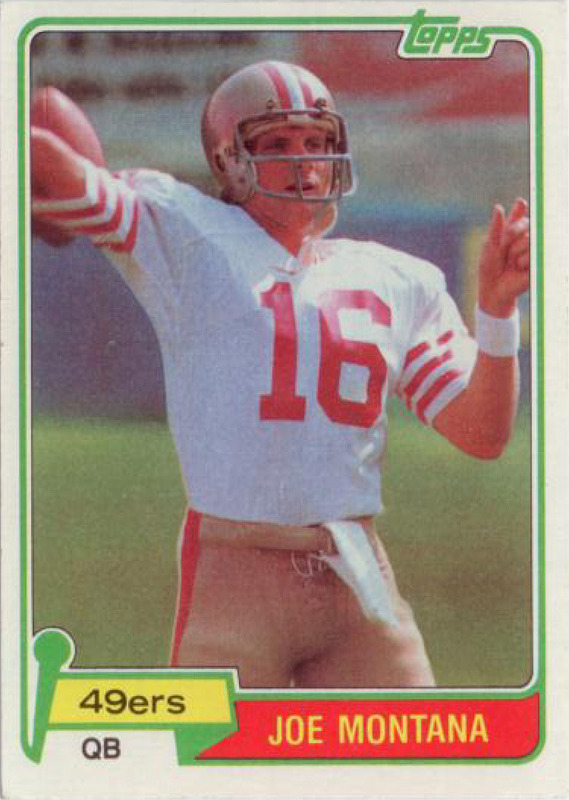 Joe Montana was the MAN as far as I was concerned watching football as a kid. He was the only other quarterback in the league that I was a fan of besides Jim Kelly of course. This card represents me being a fan of the legend. But how I got the card makes it even more special to me. I began card collecting sometime around 1988-1989. I would go down to the corner store, get a few packs and bust them open. My friends and I discovered the Super Flea on Walden in Cheektowaga and quickly became frequent visitors on the weekend buying, selling, and trading our favorite sports cards. It became a little lucrative as well when we would pull some great rookie or chase card from a pack. My father became interested in why we were spending all of our weekend mornings at card shows and card events. He started to take us (instead of us taking the bus) and got into the fun with us a little bit. For me, it was great because it was something we could talk about besides working on the family car or tools. We never had much money growing up, and most of the expendable income I had for trading cards came from me cutting grass, shoveling snow, etc. Dad really did'nt have the means to blow his cash on my weekend hobby. But once in a while, he did pull out a few bucks to get me a pack or 2 that was above my own means to get it. I'm certain he saw how excited I was when we got something great. One particular weekend however, we were looking at older sets of cards. It usually was window shopping only because we weren't going to shell out a few hundred bucks for something that was essentially cardboard with pictures on it. We were looking at sets from the late 70s and early 80s with my dad talking about how great Terry Bradshaw was, and me talking about Joe Montana. Out of the blue, dad says "so, which one of these sets is the most valuable here?" Of course, I pointed right to the holy grail, super-bowl-Joe... "Montana's rookie year of course". He reached back into that old beat up wallet, pulled out 2 crispy $100 dollar bills, and simply said "get it". I was blown away... couldn't even think of what just happened. We got the set, and I asked the guy if he could throw in a special card holder for Montana, and a few extra packs of some mid-80's football (I was still going to try and haggle of course!). Dad and I went through the set, talking about the different cards in the set, and who some of the great were... Bradshaw, Art Monk, Kelen Winslow, Phil Simms, Dan Fouts, Joe Theisman, Ed Too Tall Jones, Walter Payton and so much more. 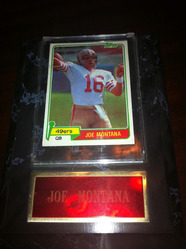 We put the Joe Montana in it's special case, and It's been there ever since. When people talk about cards, the first question out of everyone's mouth is "how much is it worth". For me, with this card, the answer is always - "priceless".